Strollers are a popular baby gift and shower present. Before you put a model on your registry, evaluate all your options by pushing different models around a store. If you end up using your stroller frequently, your baby will spend a lot of time in it, so choose the best model for you and your child. Use this guide to help you hone your search. Your child is precious cargo. You need a stroller that will keep your baby safe, comfortable, and also fit your budget. But what makes one stroller cost $100 and another fetch more than $1,000? Several factors actually, including modern styling, lightweight materials, and more features than you can shake a rattle at. But you don’t have to spend a fortune to get a good stroller; it’s all about how you will use it, and what’s important to you. 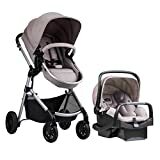 Traveling with a newborn requires special stroller consideration: Until the age of 6 months, or until your baby develops neck and head control, you will need a carrier or travel system that reclines fully to safely support your infant. 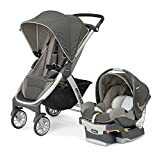 Owning a stroller that comes with a car seat (such as a travel system) or is compatible with an infant car seat you own, can simplify your life. 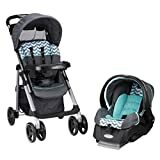 Some first-time parents start with an all-in-one travel system, which consists of an infant car seat, a car seat base, and a stroller. 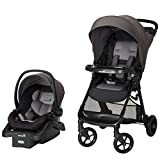 They can be heavy and take up more room than just a stroller frame, but once your baby reaches 6 months and can sit up, you’ll have the flexibility to use the travel system stroller without the infant seat snapped in. Some travel system strollers can accommodate an infant less than 6 months old without the car seat if the seat reclines to nearly flat. 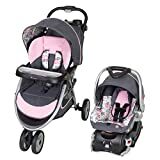 A travel system is costlier but a good value because the stroller can be used after your child outgrows the infant car seat, unlike a car seat carrier frame. For the first 6 months to a year, if you’ll be taking your infant in and out of a car frequently, a lightweight car seat carrier frame is a good choice. These bare-bones frames let you attach an infant car seat. Simply remove the infant seat from its base in the car, baby and all, and attach it to the frame. “Universal” carriers can accept a variety of car seat brands; most use a strap that you fasten around your car seat to secure it. Some manufacturers offer car seat carrier frames that are specifically intended for use with their own car seat models. These are even easier to use, as you can just snap the car seat into the frame, with no straps needed. Great for letting your snoozing baby continue his nap. When you’re done strolling, snap the car seat back into its base inside the car and go. Stroller frames are inexpensive and lightweight, making them handy for quick trips to the market, or for taking on a bus or train. Once your baby is sitting up, you’re likely to take longer strolls, taking him with you on errands, trips to the parks, aquariums, and playdates. Will you stroll straight out of your house, or will you need to drive or take mass transit to get around? These could be deciding factors in the stroller you choose. Mass Transit or Suburban Crawl? 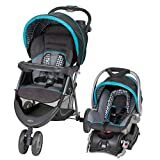 If you live in a city and rely on subways, buses, and cabs, you’ll need a lightweight, compact stroller that’s sturdy and folds easily and quickly. A car seat carrier frame would work well, as would a lightweight travel system. For an infant older than 6 months, or toddler, consider a lightweight umbrella stroller. A sturdier stroller may be easier to push on long walks. But bigger often means heavier and will be more challenging to carry upstairs, or use on public transportation. If you have a car, make sure the stroller fits easily into the back seat or trunk. Often even more helpful than a user’s manual, many stroller company websites feature virtual test-drives. You can watch videos of parents putting a stroller through its paces: walking, running, navigating city sidewalks, and boarding airplanes. But if you plan to buy online, be sure to check out a stroller at a retailer first. • Are you comfortable with the handle height and grip? Make sure your legs and feet don’t hit the wheels as you walk. If you’re going to share the stroller with a partner, both of you should try it out. • Check maneuverability by adding weight, such as a heavy handbag, to the stroller seat while you push. • Are the brakes or swivel lock mechanisms easy to use? • Is it easy to adjust the backrest, and fasten and unfasten the harness? • Is the stroller easy to lift and carry, both when open and when folded? • How easily can you open and close the stroller, with one hand and two? Some that need two hands are actually easier to operate. • How about storage? If you carry lots of gear, make sure there’s room for it. 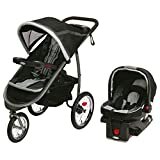 All strollers sold in the US must comply with the mandatory federal safety standard, 16 CFR Parts 1112 and 1227, which incorporates, by reference, the most current version of the ASTM stroller safety standard (ASTM F833-15, currently). 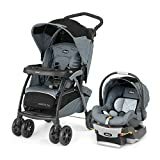 For additional reassurance, look for a sticker on the stroller or on the packaging showing that the manufacturer takes part in the certification program administered by the Juvenile Products Manufacturers Association (JPMA). 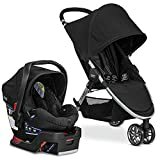 Some of the key tests are for the stroller’s brakes, stability, restraint system, leg openings, locking mechanisms, and the absence of sharp edges and points that can pinch, shear, or scissor a parent or child. Check the JPMA’s website to find certified stroller brands.